Our readers nominated their favorite subscription boxes, then voted on which of those boxes they loved most. Here’s what they chose as the Best Specialty Beauty Subscription Boxes! There are so many beauty subscription boxes today– hundreds, in fact! And while we love a good $10 box filled with a variety of samples to try, there’s nothing better than finding a good subscription that delivers exactly what you need or want. We define “specialty beauty boxes” as those with some kind of niche or focus on a particular product, for example: boxes that focus on skincare products, subscriptions for just nail wraps, and vegan or cruelty-free boxes. Since this category is so widely varied, were grouping the results into these categories by popularity– and each box listed under each category is in order of popularity, too. These boxes were hand-picked by our readers, but we’ll be sharing what differentiates them so you can find the best ones to try yourself for your particular beauty routine. The Cost: $24.95 per month ($34.95 for non-recurring purchase). Sign up here! Brands included in past boxes: Avene, Paula’s Choice, Skinceuticals, ByTerry, Jane Iredale, Juice Beauty, and more. About this box: Beauty starts with gorgeous, healthy skin, which is why BeautyFIX by Dermstore.com primarily focuses on can’t-miss skincare– including prestige brands and new product releases. You’ll get over $100 worth of beauty products per box, including hair care, cosmetics, useful skincare tools, and of course, nourishing treats for your skin. Check out all of our Beauty Fix reviews to learn more. The Cost: $49.95 a box ($39.95 a box with a 6-month subscription.) Sign up here! Brands included in past boxes: Skinowl, Josh Rosebrook, Odacité, OSEA, Tammy Fender, and more. About this box: If you’re looking to make a switch to clean beauty or explore new green brands, The Detox Box from Detox Market is a popular option to check out. Each month, you’ll get a box featuring one or more green beauty products from their selected brand of the month at a value of at least $90 with complimentary shipping. Check out our Detox Box Reviews to learn more. The Cost: $115 for three months (which breaks down to $38.33 per box). Sign up here! Brands included in past boxes: OSEA, Josh Rosebrook, Siam Seas, Fitglow Skin, Ayuna, Skinowl, and more. About this box: Beauty Heroes also features a single brand each month, with one big full-size “hero” item and an additional deluxe sample “sidekick” (or sidekicks) in each box. Beauty Heroes adheres to a strict set of guidelines when curating their products, ensuring that you’ll never receive a product containing parabens, synthetic fragrance, GMOs, or ingredients banned in the US, EU, Canada and Japan– plus 20 more harmful chemicals and ingredients on their Villain Ingredient List. All of their brands are also cruelty free (and source ingredients from cruelty-free companies, too). Members also receive 15% off in their shop. Check out our Beauty Heroes Reviews to learn more. The Cost: $39 a month. Sign up here! Brands included in past boxes: One Love Organics, Luxe Botanicals, Lilfox, Kahina, and more. About this box: The Clean Beauty Box by Art of Organics features just a few select luxe brands each month, similar to Beauty Heroes and The Detox Box. Their full-sized products are carefully selected by their team and have an average retail value of $70+. Members also receive a 15% off discount in the Art of Organics store, too. Check out all of our Clean Beauty Box Reviews to learn more. Boxwalla Green Beauty Box – Artisanal Clean Beauty from the U.S. The Cost: $49.95 every other month. Sign up here! About this box: Boxwalla is a subscription box company dedicated to sharing the best food, books, films, and green beauty items: They actually curate bi-monthly boxes in each of those categories! The Green Beauty Box contains luxurious and effective green beauty products for your skin and body. The products are crafted by artisans from all over the US (often brands not seen in other boxes), and all products are full-sized or large travel-sized products and are cruelty free. Check out our Boxwalla Green Beauty Box Reviews to learn more. The Cost: $40/month. Sign up here! Brands included in past boxes: This box is all about making product yourself, so you’ll receive ingredients instead of branded products. The Cost: $22.95 a month. Sign up here! Brands included in past boxes: Both well-known and indie brands, like Yes To, Mr B’s Necessities, Cosmedica, Saiva Naturals, and more. About this box: Each Vegan Cuts Beauty Box contains a mix of 4-7 full and sample size cruelty-free beauty must-haves, ranging from bath & body products to skincare to haircare. They will sometimes include a makeup item as well, but Vegan Cuts also has a separate quarterly box ($39.95 every three months) dedicated to vegan makeup. All items are void of toxic ingredients and animal byproducts. The Cost: $15.95 a month. Sign up here! Brands included in past boxes: Exclusively Medusa’s Make-up products. About this box: This monthly box from Medusa’s Make-up features 3-5 items from their house brand every month, including vegan eyeshadows, lipsticks, and more. Medusa’s catalog is notoriously full of bold colors: think deep dark reds, neon eye dusts, and products with a lot of sparkle. If you’re curious to try their products and experiment with bolder looks, this is a great way to try out some new ideas without breaking the bank. 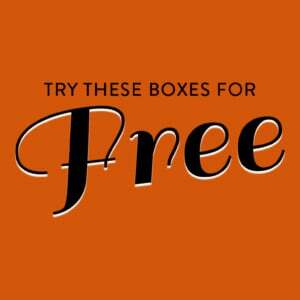 Check out all of our Medusa’s Make-up Beauty Box Reviews to learn more. Ships to: Worldwide. Free shipping for US, $4 USD for International. The Cost: $29.95 a box (Or $47.95 for the VIP subscription, which includes an additional full-size beauty product with a value over $35). Sign up here! Brands included in past boxes: Well-known and indie brands. About this box: LOVE GOODLY sends a mix of beauty and skincare products and samples, wellness products, healthy snacks and eco-friendly style or home accessories. Some boxes are almost entirely focused on beauty products, but more often this box includes accessories and snacks and other items, too. All products are vegan and cruelty-free. Check out all of our Love Goodly reviews to learn more. The Cost: $29.95 a month. Sign up here! Brands included in past boxes: Cruelty-free brands like Vapour, Laritzy, Nomad Cosmetics, and more. About this box: Benevolent Beauty sends out strictly cruelty-free items in the categories of cosmetics, hair care, skin care, and beauty tools. The Monthly VIP box contains 4-7 full-size items each month, and the Monthly Mini box contains 2-3 full-size items each month. Their cruelty-free standards ensure that no featured brand tests on animals, is owned by a company that tests on animals, or includes ingredients from companies that test on animals. Check out all of our Benevolent Beauty Box Reviews to learn more. The Cost: $18/month. Sign up here! About this box: Petit Vour is a monthly vegan and cruelty-free beauty subscription box that sends out 4 makeup and beauty products in each box, including both full-size and sample-sized items. They only send non-toxic and plant-based products, making this the most affordable box in this category if you’re interested in trying many different green beauty brands. Check out all of our Petit Vour Reviews to learn more. Brands included in past boxes: Both well-known bath brands and smaller indie products. The Cost: $29.99 a month. Sign up here! Brands included in past boxes: This box only sends products made by Bliss Bathhouse. About this box: Bliss Bathhouse is a homemade natural bath product company based in Ohio. Their subscription box includes a 5 full size bath products such as bath bombs, scrubs, soaps, and lotions, plus additional lifestyle items that go along with the monthly theme. The Cost: $20 per month. Sign up here! Brands included in past boxes: DevaCurl, African Pride, Curls, Eden Bodyworks, Shea Moisture and more. About this box: Each month, curlBOX sends you 4+ samples of hair products designed specifically for curly hair– ideal if you’re new to wearing your hair natural and want to try different products to see what your curls like best. (We haven’t reviewed this one ourselves, but it looks like some boxes contains both sample and full-size products.) CurlBOX also offers a Premium box as well as limited edition non-subscription boxes at a higher price point, which may be brand-takeover bundles or boxes curated around a theme like the Lavender Box and Shea Moisture Baby Box. The Cost: $29 a month. Sign up here! Brands included in this box: Various Japanese beauty brands. What you’ll get: Kira Kira Crate sends you a variety of Japanese beauty products each month, in categories like Daily Care, Cosmetics, Pamper, and Bath & Spa. All boxes come with an booklet with instructions translated to English, and they usually have a theme, too: Year of the Dog, Sakura, Treat Yourself, and more. Check out all of our Kira Kira Crate Reviews to learn more! Ships to: US and most international countries. The Cost: $15 per month. Sign up here! About this box: Each month, Nexus will send you two brand new nail wrap designs– and subscribers get to vote on which one they love more! Boxes typically have a theme with two competing designs (like the “yellow submarine” vs “jellyfish” designs pictured above) and, thanks to their nerdy subject matter, are sure to be a unique conversation starter. Check out our Nexus Reviews for more info. That wraps up our list of the best unique & specialty beauty subscriptions! Which boxes do you recommend? Yuzen is no longer selling subscription boxes!